A blizzard of fast-falling snow and high winds walloped coastal communities south of Boston on Monday, flooding roads and cutting power to thousands as the second storm in four days roared through the region. The strongest winds raked Nantucket, where a gust of 65 miles per hour was recorded and 1,500 customers lost power temporarily. However, damage in Eastern Massachusetts seemed to be relatively light, with no serious injuries reported by Monday evening and much of the lost power restored. By late afternoon, Eastham and Yarmouth Port recorded the most snow in the region, with 9 inches each. “We’ve been pretty lucky,” said Norwell police Captain Ken Benting. Snow totals Monday night included 9 inches in parts of Orleans, 9 inches in Yarmouth Port, 8.9 inches in Centerville, 8 inches in Brewster, 8.8 inches in Oak Bluffs, between 4 and just over 6 inches in parts of Middlesex County, 6 inches in Fitchburg, 4 inches in Westfield, 6.5 inches in New Bedford, and 4.7 inches in parts of Boston, according to a weather service advisory. Read: Live updates: Winter storm hits Mass. Explore: Map: Power outages in Mass. Read: Snow totals so far in Mass. Predictions of pounding seas and as much as 18 inches of snow had worried coastal residents who retain vivid memories of last winter’s crippling storms. As high tide approached shortly before 11 a.m. in Marshfield, residents ran through flooded streets in desperate attempts to move their cars to higher ground. Some didn’t make it in time: A Mercedes sat half-submerged outside an oceanfront home. Boston and many other communities closed schools Monday, the state Highway Department dispatched more than 3,300 vehicles to keep roads clear, and speeds were reduced to 40 miles per hour for the entire Massachusetts Turnpike. “Roads wet to snow-covered,” the state Department of Transportation tweeted on Monday night. Boston schools were scheduled to reopen Tuesday morning, and any lingering snowfall along the coast north of Boston was not expected to significantly affect voter turnout in the New Hampshire primary. The subway lines had no shutdowns, said MBTA spokesman Joseph Pesaturo. Stephanie Pollack, the state’s transportation secretary, said the commuter rail system had a 91 percent on-time record Monday morning, which is typical for a weekday. The T had reported minor to moderate delays throughout the day on the Red, Green, Orange, and Blue lines. The agency also tweeted out photos of workers clearing the Green Line tracks of snow and ice. Airborne travelers were not as fortunate. The Massachusetts Port Authority, which runs Logan International Airport, said 30 percent of all flights had been canceled on Monday. By Monday evening, 170 flights out of Logan had been canceled and 70 delayed, according to the tracking service FlightAware. Eversource reported that power had been restored to all but 115 of more than 6,000 of its customers who lost electricity. By comparison, more than 100,000 customers had been affected by Friday’s storm, largely due to the combination of heavy, wet snow and strong winds, according to Eversource spokesman Michael Durand. National Grid officials said late Monday afternoon that about 100 of its customers lacked power, and that number was lowered to 48 customers by 9:30 p.m. Earlier in the day, power was quickly restored to 1,500 customers on Nantucket who had lost power, spokeswoman Mary-Leah Assad said. On roads across Massachusetts, the storm resulted in few injuries and mostly minor crashes, mainly spinouts or cars sliding off the road, according to David Procopio, a State Police spokesman. A crash between an SUV and a flatbed truck on the ramp from Interstate 93 north to Furnace Brook Parkway in Quincy resulted in the SUV driver, a 32-year-old Roslindale man, being transported to Quincy Medical Center for minor injuries. Additional crashes were reported on Interstate 95 northbound in Lexington, a truck rollover on Interstate 495 northbound in Tewksbury, and a jack-knifed tractor trailer on Interstate 90 in Framingham. No injuries were reported during those mishaps. The short list of injuries was a relief for safety officials, only days after falling tree limbs killed two Canton residents in the previous storm. But at the coast, the fury of the storm brought a winter warning. Roaring winds battered oceanfront cottages at White Horse Beach in Plymouth, blowing fist-sized chunks of sea foam sideways through the air. The sticky, sand-colored foam coated wooden clapboards and shingles and piled up in gaps between the frozen, snow-capped sand dunes. Just before high tide, massive waves pushed sheets of water up the sand, where they washed under wooden houses raised on stilts. In Sandwich, Deputy Police Chief Michael Nurse reported white-out conditions before the storm subsided by afternoon. The state highway administrator, Thomas Tinlin, toured much of the hardest-hit areas Monday and said the severity of the storm changed almost every 2 miles. Although the snow dissipated as the day wore on, a flood advisory was issued from 10 p.m. Monday to 2 a.m. Tuesday for the Plymouth County coastline from Hull to Plymouth, the north- and east-facing shorelines of Cape Cod, and the north and east coasts of Nantucket, including Nantucket Harbor. 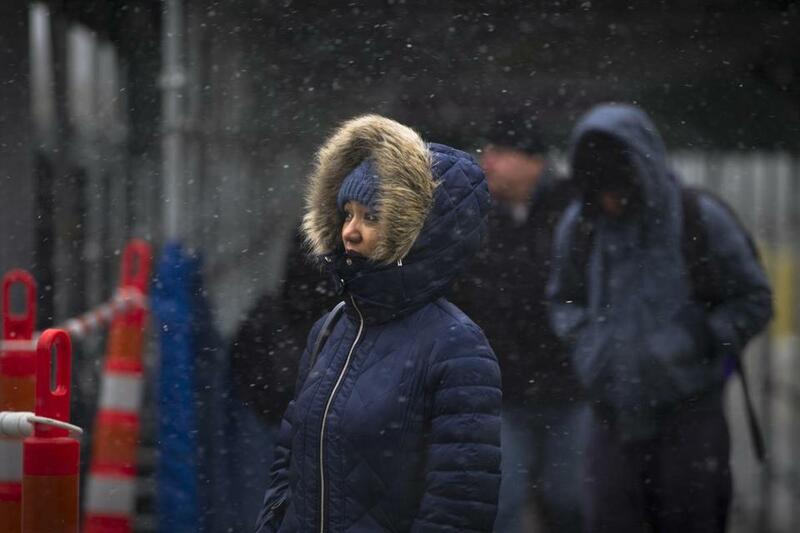 Ranju Shrestha of Dracut was one of the commuters leaving North Station to find driving snow and winds Monday morning. 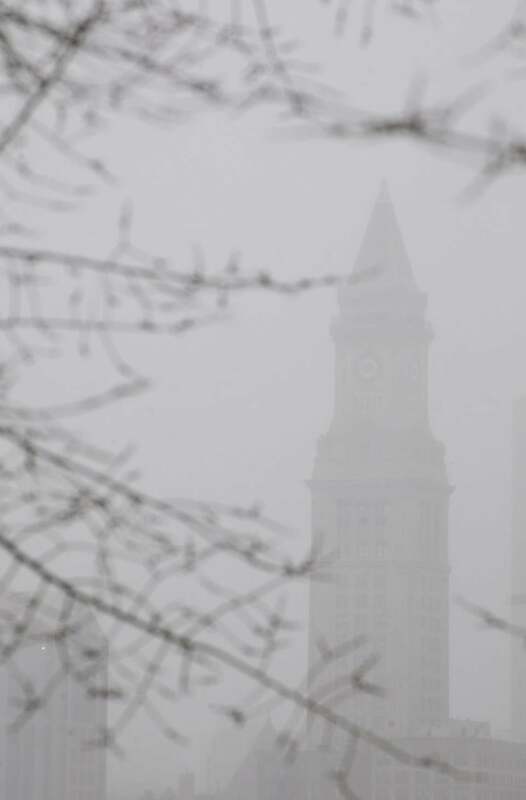 The Custom House Tower was barely visible as a snowstorm arrived Monday morning in Boston. 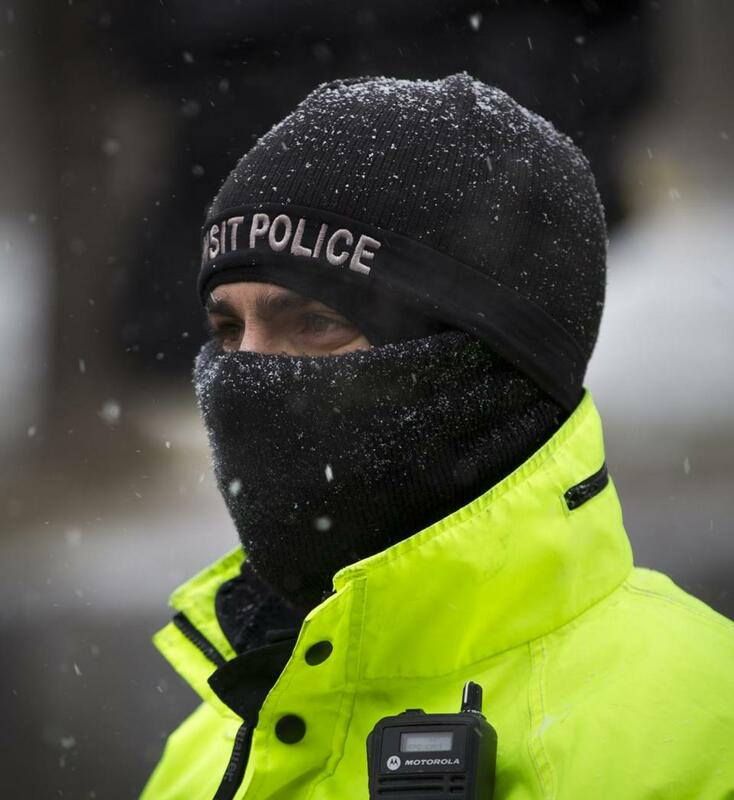 A Transit Police officer helped guide commuters across Causeway Street in Boston as snow began to fall Monday in Boston. Travis Andersen, Jenna Russell, Thomas Farragher, David Scharfenberg, and John R. Ellement of the Globe staff, and Globe correspondents J.D. Capelouto and Mina Corpuz contributed to this report. Brian MacQuarrie can be reached at brian.macquarrie@globe.com. Follow him on Twitter @GlobeMacQuarrie.